Over/Under: Under 147.9 at 1.90 Bet Now! The second Euroleague game of Thursday night also features two teams that lost in the opening round of fixtures. 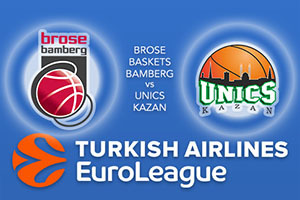 It was narrow defeats for Brose Baskets Bamberg and UNICS Kazan so it is not as if either of the two teams should be disheartened or demoralised just yet but the longer you go without a win, the harder it will become to keep up and hunt down the rest of the league. The Germans lost by a point in their last outing, to the highly fancied Fenerbahce, so it is not as if they’ll be too despondent. If they can carry the same sort of energy and passion in this game, they should find that they are in the running to take a win. Nikos Zisis managed to grab 11 points in the loss but it was Darius Miller who was the best offensive option for the Germans in Turkey as he provided 17 points. Expect Miller to be a crucial player in this game and if he can do his job, while keeping his opponent quiet, the hosts should have enough about them to grab the win. With just 63 points scored last week, in a 63-69 loss to FC Barcelona Lassa, UNICS Kazan are the lowest scorers in the league going into round 2. The fact that this defeat came at home will be a big concern and the team may struggle in Germany this week. Latavious Williams was the best offensive player for the Russian team with 15 rebounds while Keith Langford managed to pitch in with 14 points. It wasn’t enough to help the team grab a win but if they can deliver this sort of performance away from home, there is a good chance that the Russians will salvage some pride and give themselves something to work with in this game, and the weeks ahead. It could be a close affair but going on last week’s showing, and with home advantage, you have to think the Germans are the team to tip going into this one. This means you should take Brose Baskets Bamberg at -4.5, which is provided at odds of 1.90. If you’re looking for the Over/Under market in this match, opt to go UNDER 147.9 which you can find at odds of 1.90. Bet Now!